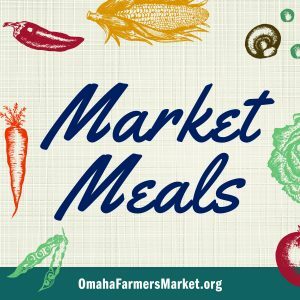 Turnips are like Brussels Sprouts in that a lot of people know they exist, but few people like them or know what to do with them. If you are solidly in the anti-turnip camp, or scratching your head trying to figure out what one looks like, I understand, and I think we can work through this together. 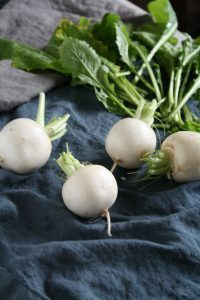 Turnips are one of those late spring or fall crops. 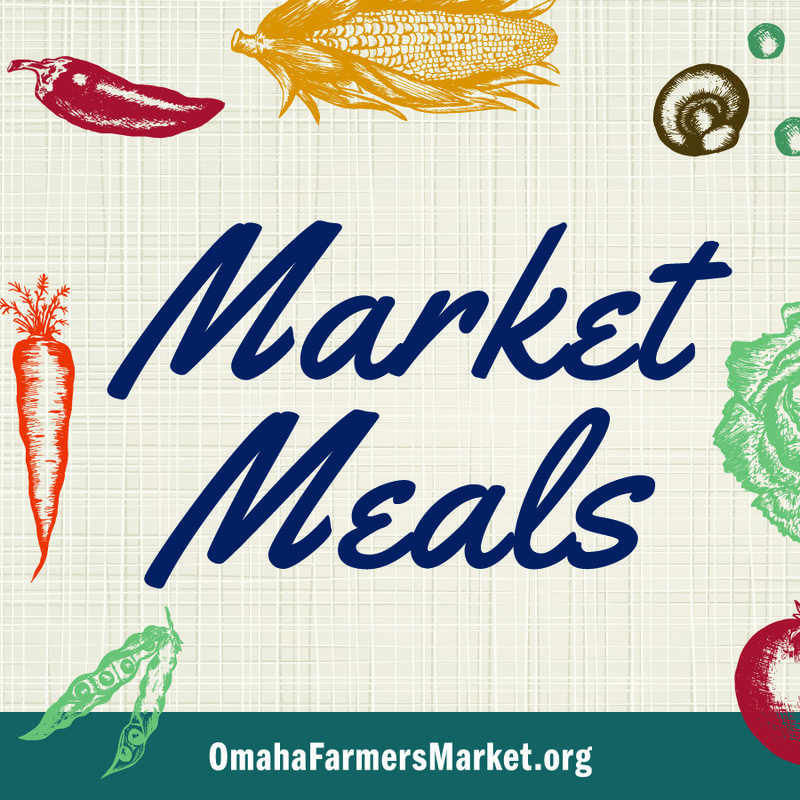 You can find purple top or white egg turnips at the farmers’ market now. They can be bitter or woody if they are a bit too large or have been stored for a long time. A little sugar when cooking can generally balance out the bitterness. If I have older turnips, I tend to peel them, but if they are fresh, tender, and small I keep the skin on. When I teach cooking classes or speak to groups about food a few themes tend to pop up during the question and answer sessions: lack of knowledge, lack of time, and a fear of taking risks in the kitchen. Growing up most of us were told not to waste food. While this philosophy certainly has its attributes, it also stifles our creativity in the kitchen. We have a fear of wasting food, which also wastes money. 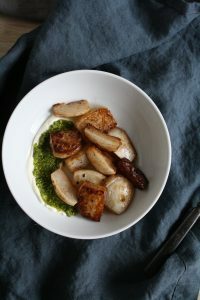 Combine these practical concerns with Midwestern reserve, and less time at home, and we have a whole host of undiscovered culinary joys just waiting for us to throw caution to the wind and toss the lobster in the pot, or, um, the turnips in the frying pan. We have developed a deep fear of failing when it comes to cooking, however failure is a critical part of learning, well, anything. We have somehow built a culture where every meal should be presented to the table like an actress appears on a stage. That’s a lot of pressure, and it makes no sense to me. Cooking simple food, in simple ways can be done. It has been done. We have lost the skills to do it without thinking too much about it, and at least for me, thinking is a precious resource when living in a household full of children who assault my senses. In June 2015, the American Chemistry Council released a study stating that American households waste $640 per year per household in uneaten food. I’d venture to guess most of this food is forgotten leftovers, things we’ve decided we just aren’t in the mood to eat or something we were too tired to prepare so we left it to rot in the fridge. I highly doubt much of that waste is because someone decided to give a new vegetable a try, and couldn’t stand his own handiwork at the stove. I had been a vegetarian for a decade when I met my husband who is a hunter. I eventually began to eat meat, but had little to no experience cooking it. The first time I made a pot roast the thing was like chewing leather. Of course, I had invited people over for a dinner party to indulge in this meaty delight. Everyone was gracious, and choked it down. Now that I understand what a good pot roast should taste like, I’m even more grateful for their kindness. The point is I survived to make another pot roast, and you will survive your kitchen failures too. Maybe this season should be about kicking fear out of the kitchen, and ditching dinner expectations. Let’s reclaim our sense of adventure, our expectation of flavor, and grant ourselves a little grace in the kitchen. Maybe it’s time we forget about Pinterest, reacquaint ourselves with the stove, and welcome new foods into our lives. Not fancy food, or, God forbid, foodie food, but just food. Maybe it’s time we take a deep breath, taste what we eat, and declare it good enough — even if it’s a turnip. Large turnips or those that have been stored for a while can have a bitter aftertaste. A bit of sugar, as this recipe calls for, can eliminate that problem. If you have small, young turnips, you can omit the sugar. 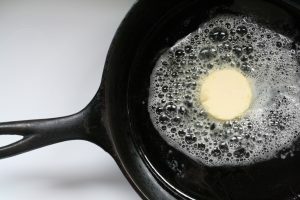 Melt butter in a large cast iron skillet over medium high heat. Once foam subsides, add turnips in a single layer, salt and pepper. If you’re pan isn’t large enough to place them in a single layer then sear them in batches. After about 2 minutes use a fork to lift a turnip. If it’s browned flip it over, and follow suit with the rest of them searing at least two sides of each turnip. Once turnips are seared, add water and sugar. Be careful it will bubble, and could splatter when the water is added. Reduce heat to medium, cover leaving the lid slightly ajar and cook until turnips are tender and most of the liquid has evaporated, about 15 minutes. Spoon turnips into serving dish. Add crème fresh and pesto. Stir to coat. Serve. If you want to get fancy. Smear the crème fresh on the side of the serving dish. 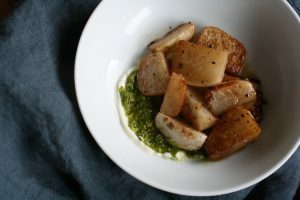 Top it with a smear of the pesto and arrange the turnips alongside of it. Add salt and pepper to taste. We’ve reached the time of year where these tender greens are bolting in the garden. Now is the time to turn them into pesto. You only need a little for this recipe, but you can freeze what remains in an ice cube try to use when needed. Combine everything into a food processor. Pulse until well incorporated, and uniform. Spoon into a dish. Keep in refrigerator for up to a week. Use as spreads on sandwiches or a way to dress up vegetables, pasta dishes, or soup.